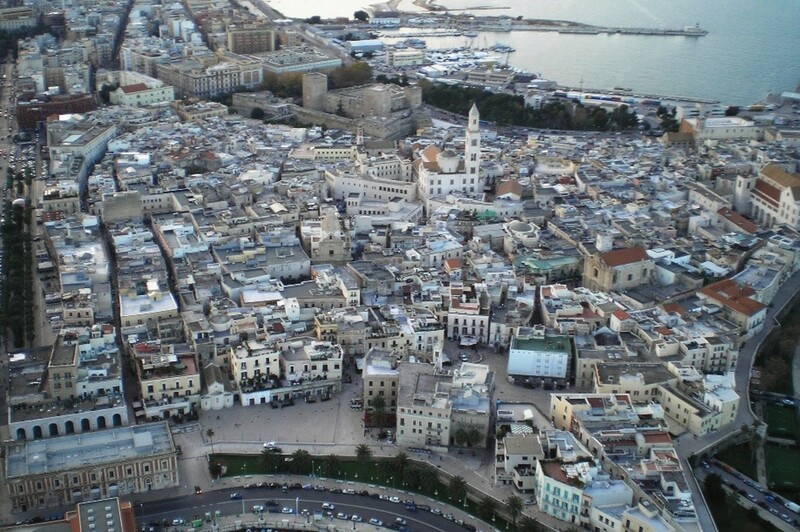 A captivating place to discover, Bari is a city of multiple faces with its elegant Murat district, the longest seafront in Italy, stretching along the Adriatic Sea, and the spell binding area of Bari Vecchia (Old Bari). Wind and sea caressing the walls and palaces of Bari throughout: buildings designed “umbertino” or “littorio” style (architecture style used during the fascism time), or liberty such as the Teatro Kursaal Santa Lucia, eclectics like the Provincial Government Building or the Albergo delle Nazioni monument. In the evening, the heart of the nightlife surrounds the between Piazza Ferrarese and Piazza Mercantile close to the sea-walls. 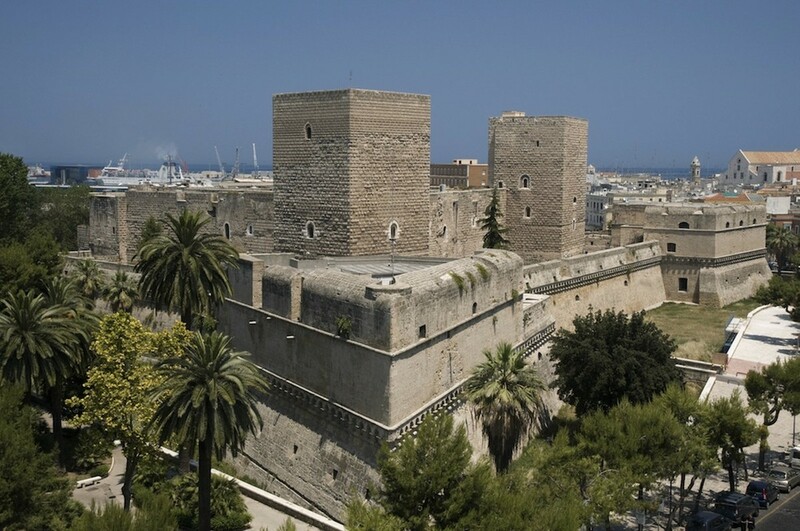 Acting as a gateway to the old city, the grand Castello Svevo (Swabian Castle) is crowned with fortified towers. Once used as defensive castle, it later became a Renaissance residence. The Arco del Pellegrino (Pilgrim’s Arch) leads through to the heart of the Cittadella Nicolaiana and its Basilica di San Nicola, a prized example of Puglia’s Romanesque architecture that's dedicated to San Nicola, Bari's patron saint. 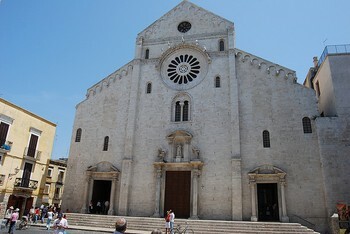 Nearby is the romanesque Cathedral of San Sabino, with its baroque crypt. Bari’s 19th century Murat district boasts many elegant palaces, such as the Teatro Petruzzelli, Teatro Piccinni, and Palazzo Fizzarotti, while underground, you'll find hidden treasures: rupestrian churches and hypogea dug into the rocks, such as the Temple of San Giorgio, the hypogeum of Madia Diana, and the "Jewish" hypogeum. It’s nice to walk in the early morning, when the bustling night spots, between Piazza Ferrarese and Piazza Mercantile are closed. Go a little further along the ancient walls, to enjoy the sea view and harbour. The old town of Bari appears to enjoy itself. It’s easy to run into old ladies on their front door, kneading pasta and leaving the orecchiette (local pasta), to dry out the on the frames. You can smell strong scents, such as a good coffee made with the Italian moka (espresso machine) or the stronger scents of “ciambotto” – dialect expression for mix - the famous fish sauce made by mixing multiple specialties. The past is intertwined with present new ambitious cultural projects, which show Bari as a progressive city, a soon to be active example is the MUSASS - Archaeological Museum of Santa Scolastica. In front of the historic centre opens the Bari Murattiana, just like Murat wanted in 1813, with its grid of streets and beautiful buildings. If you love to jog, it’s hard to find a better place than the imposing waterfront of Nazario Sauro. Passing through the Arco del Pellegrino you are in the heart of the Nicolaiana citadel, in what was once the residence of Catapano, the Greek-byzantine governor of southern Italy. Wherever the eye rests you are surrounded by history, you are part of it. Admire the façade, enclosed on either side by two towers, decorated with three doors, three large windows and five mullioned windows under the Catherine wheel. Along the sides, however, opens a succession of arches which overlap with well-decorated portals. Along the north front stands the rich embellishment of the Porta dei Leoni, where the agricultural grounds are mixed with liturgical. The interior has three naves divided by granite columns, while the vault is proudly displayed with its baroque ceiling. Centrally located there are the ciborium above the altar and the Chair of Elijah supported by grotesque figures carved from a single block of marble. Move slightly to the left to see the valuable apse panel of the Vivarini Madonna and Saints. Along the right aisle towards the crypt, find the Miraculous column, while under the main altar is the tomb of St. Nicholas. 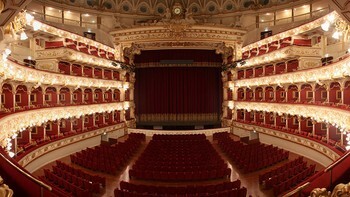 The largest private theatre in Europe, the fourth largest in Italy. 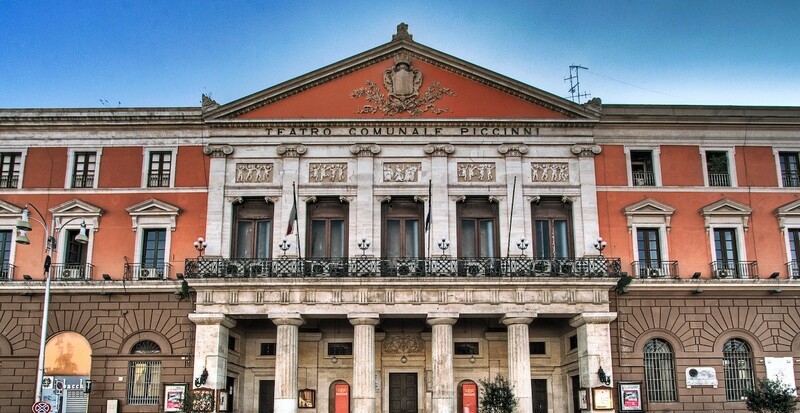 It’s in the heart of Bari Murattiana, on Corso Cavour, surrounded by elegant streets and majestic palaces. Opening in 1903, it hosted major international artists such as Rudolf Nureyev, Carla Fracci, Ray Charles, Frank Sinatra, Luciano Pavarotti. Today, you will admire it restored to its former glory after the fire of 1991, decorated in gold with interiors by Raffaele Armenise. The construction commanded by the Norman King Ruggero II, grandfather of Frederick II of Swabia, was partly destroyed in 1156 by the people of Bari tired of the struggle and rebellion against the Normans. In 1233 Frederick restored it, giving it a new form. The stone became soft, windows were built into the towers, to mitigate the austerity and giving the castle a more homely feel. The vestibule is covered by vaults and decorated with different iconic columns: some have Islamic figures, one has 10 heads lined with helmets that resemble those of Roman legionaries, others bear the signatures of those who have carved them. In 1500, Isabella of Aragon and her daughter Bona Sforza, the future queen of Poland, helped the castle reach its peak by becoming a Renaissance residence with a court where they housed artists, writers, humanists and powerful dignitaries. Today, the inner courtyard, with its sumptuous and monumental staircase and double wing is the result of those years spent restructuring. Under the right slope of the staircase are the three rooms of the Gipsoteca gallery, one of which is still undergoing restoration. When open, you will see unpublished documents such as the photographic plate of the historic palace of Frederick II in Foggia, which no longer exists. The other two, divided by territory, there is a rich collection of plaster casts, which includes details of the most important monuments of the region, from the Middle Ages to the early twentieth. 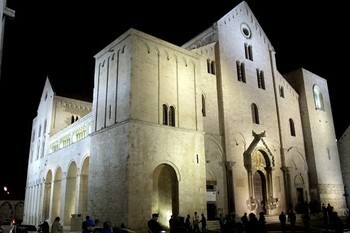 It is one of the greatest examples of Romanesque style in Puglia, built on the ruins of the former Byzantine church. The exterior is only enriched by the great rose window, decorated with grotesque figures and fantastical creatures with a series of single and double lancet windows. Along the gallery there is a long tunnel of arches and a “trulla”, a circular building long considered the ancient baptistery and since the seventeenth century used as a vestry. The interior is completely bare, with three naves divided by columns that watch the beautiful pulpit over a mock gallery. The ciborium on the altar is shaped like a canopy dating from the 1200’s and belongs to Alfano from Termoli. In the Baroque style crypt, are the relics of St. Sabino and the board of the Virgine dell’Odegitria, which tradition says it was painted by San Luca. 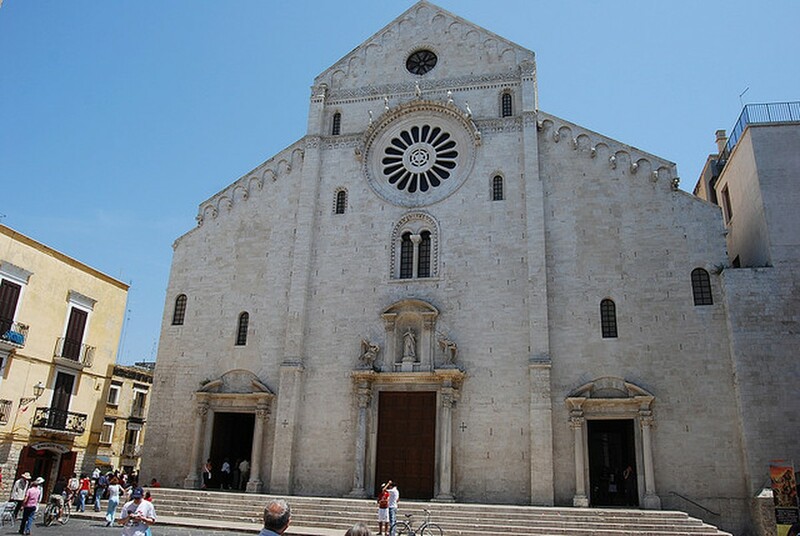 According to legend, the painting arrived in the port of Bari in 733 after a violent storm: the Calogeri monks were shipwrecked, and they were transporting the painting for Pope Gregory III, to save it from the iconoclastic fury. Bari’s people backed by the Archbishop and the Clergy forced them to leave the painting to Bari. Puglia’s true identity and authentic Mediterranean quality are expressed through its gastronomical characteristics. 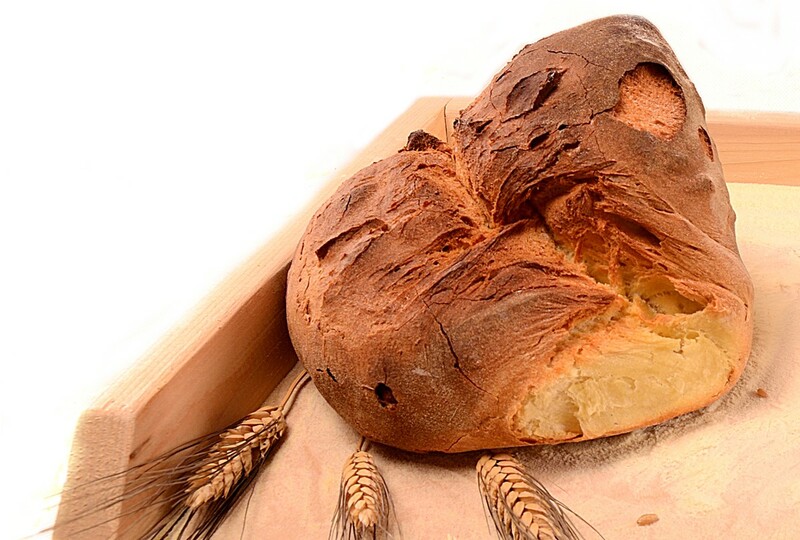 The cuisine of Puglia is essentially simple product that does not mind the noble and refined processing. Traditional Apulian cuisine is certainly amongst the wholesome and genuine in Italy. Everything is cooked in a simple way, with simple ingredients that enhance the flavour of the dish. Puglia’s cuisine combines the numerous varietals of seafood from the Adriatic and the simple and more rustic flavors from its land. Pasta, in its most original shapes, is made with simple ingredients such as water, flour and salt and is the king of main courses. Puglia is known for its handcrafted "orecchiette" (little ear-shaped pasta) which have the right shape and consistency to absorb the tasty seasonings based on vegetables, fish or meat and the most famous dish is the orecchiette with "cime di rapa" (broccoli rabe). Tiella alla Barese is another popular main dish from Puglia made with rice, potatoes and mussels. 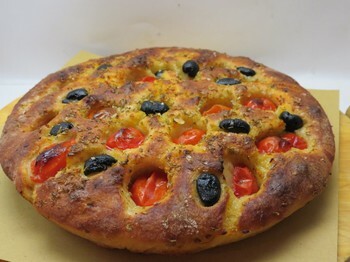 The artisanship of bakers here is evident in the preparation of focaccia, taralli, panzerotti and the famous Altamura bread, protected by its DOP label and excellent just as a side dish, delicious when seasoned with extra virgin olive oil and garnished with the famous Apulian vegetables and greens. Puglia is a paradise of olive oil and wine, olive trees and vineyards stretching as far as the eye can see. 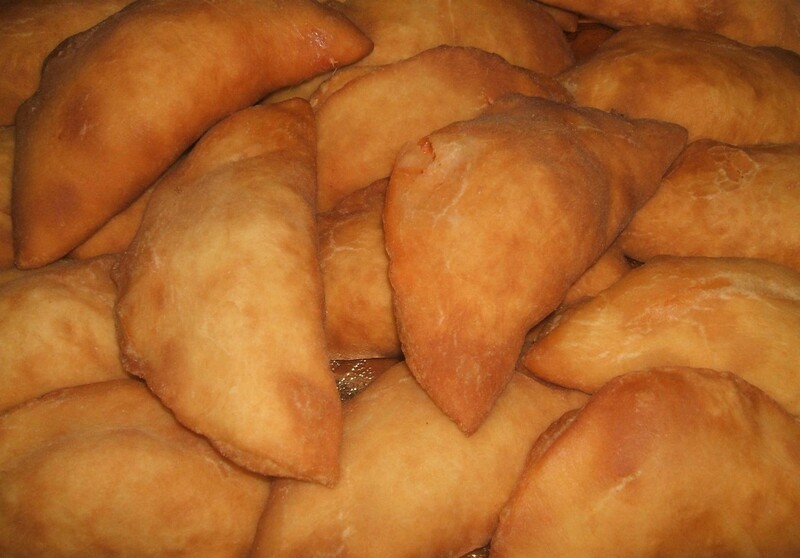 A slice of bread is all the accompaniment you'll need to taste the intense aroma of this land’s extra-virgin olive oil. 5 DOP oils coming from magnificent, centuries-old Apulian olive trees and bringing out the flavors of typical regional dishes. Follow the scent of the vineyards as you explore the wine trails. A quick stop in the DOC (Controlled Designation of Origin) wine capitals is all you'll need to be bowled over by Puglia’s resolute reds, its refined whites, and its rosés, some of the best in the world. Aleatico, Primitivo di Manduria and Negroamaro wines represent the glory of a qualified, world-famous winemaking tradition.